Lisa Kudrow, Mike Bayer and Demi Lovato (the night's honoree) took a minute to huddle at the UCLA Semel Institute's "Open Mind Gala" at the Beverly Hilton. 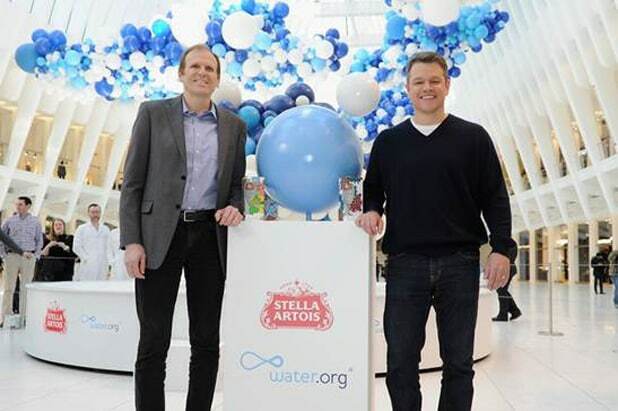 Matt Damon (and his water.org co-founder Gary White) revealed a public art installation on World Water Day (Mar. 22) in New York tied to their partnership with Stella Artois and the "Buy a Lady a Drink" campaign. Jared Leto (and Jared Leto's new hair cut) presented the Venice Family Clinic's Humanitarian Award to Warner Bros. President Sue Kroll at the Beverly Hilton on Sunday, March 26, a room that included Elizabeth Benson, Ed Helms, and X Ambassadors. Note: This is the second trophy Leto has brought to Warners this spring. "Suicide Squad" netted an Oscar for the studio. A Vaughn Family Outing: Vince and mother Sharon (left) and sisters Victoria and Valerie at the 32nd annual Odyssey Ball at the Beverly Wilshire on Saturday night, March 25. The night benefits the John Wayne Cancer Institute at Providence Saint John’s Health Center and is organized by John Wayne Cancer Institute Auxiliary, helmed by president Anita Swift, granddaughter of John Wayne. Back in Hollywood, Lily Tomlin, Baron Vaughn and Brooklyn Decker toasted to the Season 3 premiere of "Grace and Frankie" at the Arclight on Wednesday night. By Friday, Tomlin and Jane Fonda would bring some x-rated banter to the "Today" show ahead of the series' new season. Breakout political commentator Van Jones led the way at the EMA Impact Summit at the Montage in Beverly Hills. With NASCAR in Southern California this weekend, champs Jeff Gordon, Danica Patrick and Jimmie Johnson brought Mickey Mouse into their pit crews. The drivers each voice race car driver characters in the Disney Junior animated series "Mickey and the Roadster Racers." PaleyFest continues at the Dolby, with the bright, shiny names of broadcast and beyond throwing a consumer version of the TCA's. On James Corden's night, EP Rob Crabbe, Bradley Whitford (who moderated) and EP Ben Winston flanked the guy who may arguably be CBS' biggest star currently on air. From one musical guy to another, T.I. sat in with The Roots during their Bud Light Jam Session in Austin, a highlight of the SXSW music scene. Rae Sremmurd, Method Man, Redman and the underrated James Hersey all nabbed slots on Bud Light's stage. Back in L.A., the marquee musical event before Coachella was Amp 97.1's "AMPLIFY" concert at the Shrine. ...he gave the crowd a cool down. EDM songstress Delaney Jane made a surprise appearance to perform with Grandtheft, who was taking selfie videos during the collaboration. Jim Aasgier and Nizzle had the crowd chanting their group's name - "Yellow Claw" - when they came on to close Amp's show. The Amsterdam duo was a great get for the pop-focused radio station. (It's Carson Daly's radio home, where he holds down mornings.) YC would be off next to Asia for dates in Malaysia, Singapore and China. The Shrine has quietly become the go-to spot for full scale EDM shows in L.A. in the past 18 months with a VIP balcony, sponsor activations from Jeep and Budlight, and an array of photo booths. Deadmau5 follows in AMP's footsteps, coming in for four nights after Coachella. Over 750,000 people clicked over to see Ansel Elgort's piano-playing cover of Ryan Gosling's "City of Stars" from "La La Land" on Instagram this week. Before that, he was cruising the music at the Fader Fort, popping in to a VitaminWater Zero "newsstand" to keep his vocal chords hydrated.